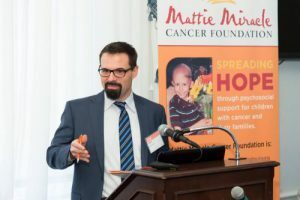 On January 24, the Mattie Miracle Cancer Foundation held a Psychosocial Implementation Policy Roundtable on Capitol Hill. This event focused on identifying the strategies and challenges for implementing psychosocial standards of care. The roundtable brought together a wide range of stakeholders including researchers, clinicians, psycho-oncologists, psychologists and accreditation experts. My colleague, Todd Schuerhoff and I had the privilege of helping to moderate the day’s events. We were honored to play even a small role in such an important occasion. The event focused on the need for implementing standards of care to ensure that access to quality psychosocial care from diagnosis, through treatment, into survivorship or end of life and bereavement care is provided to children with cancer and their families. The day was broken into six major topic areas including Outcomes, Legislative/Policy, Resourcing, Reimbursement, Accreditation, and Delivery Models. For each topic, an expert in that particular area introduced the topic and described the current landscape. Following that presentation, we facilitated a group discussion in an effort to discuss and develop strategies. We had the enormous benefit of a fully engaged, informed, and vocal group that really made the sessions meaningful and productive. With this construct, we guided the discussions to ensure that the roundtable produced tangible next steps. The necessary groups can pursue these actions to make collective progress on the implementation of psychosocial standards. As an example, one of the discussions focused on the findings of a research effort. The researchers surveyed 144 pediatric oncology medical programs to assess their readiness to implement standards-based psychosocial care. A key opportunity that emerged from that discussion was the development of a maturity model/framework. This model helps describe and categorize the state of the various capabilities these medical programs provide. This resource has the potential to help propel the industry forward, providing a tool that can help guide these programs further down the maturity curve while also helping to inform and assist both patients and medical professionals. In addition to the discussion sessions, Mattie Miracle honored several members of Congress as Mattie Miracle Childhood Cancer Psychosocial Champions. Mattie Miracle recognized them for the extremely important work they have done and for understanding that childhood cancer is not just about the medicine. Honorees included Congressman Michael McCaul (TX), Congresswoman Jackie Speier (CA), and Senator Chris Van Hollen. Each of the honorees have played critical roles in advancing and spearheading legislation and continue to be true champions in the fight against cancer. The continued support and commitment that TeraThink has provided the Mattie Miracle Foundation throughout the years makes me proud. Likewise, I am glad that I can be a part of it. I cannot express how proud we are of the tremendous work that the Mattie Miracle Foundation has done to enrich the lives of so many families who are fighting pediatric cancer today. I want to send a special thank you to Vicki and Peter Brown, co-founders of the Mattie Miracle Foundation and Mattie’s wonderful parents. They have been tireless in all that they do in advancing the state of psychosocial care to those in need. You are a true inspiration for all of us at TeraThink! Victoria Sardi-Brown and I are and continue to be deeply appreciative of all the support Dominion Consulting has given us over the years. The organization’s multi-year, multi-faceted support of the Foundation and its cause, allows us to continue to do the very important work of supporting the psychosocial needs of children with cancer and their families. Although you do not get to see what your support and commitment does, you need to know that thanks to Dominion Consulting, children with cancer and their families are getting more of the essential psychological, emotional and social support they need and deserve, across the entire cancer trajectory. So on behalf of Mattie Miracle and all children with cancer and their families, let me say thank you to Dominion Consulting for all that you do. You continue to help make the miracle happen! Joe, what a beautifully written posting that captured the energy and success of the day. We couldn’t have done it without you and Todd. Facilitation is key. Thank you for sharing your skills and expertise with us as a SWOC analysis was a great way to structure the discussions and will help with our post event write up.